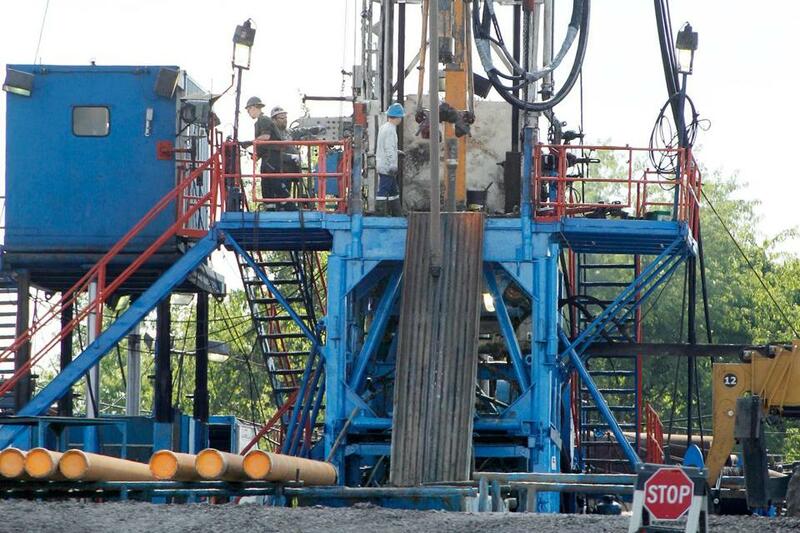 A crew worked on a drilling rig at a well site for shale-based natural gas in Zelienople, Pa. The state’s two largest utilities have signed preliminary agreements to transport additional supplies of natural gas on the principal interstate pipeline serving Boston, a crucial step in expanding a constrained gas delivery system and lowering energy costs in New England. The agreements with Northeast Utilities and National Grid allow Spectra Energy Corp. of Houston to seek federal approval to expand the Algonquin Gas Transmission pipeline in order to move abundant natural gas supplies from Pennsylvania and across the country. Meanwhile, another Houston firm, Kinder Morgan, is planning to add to another pipeline system that serves New England to bring even more natural gas here, where demand is growing. 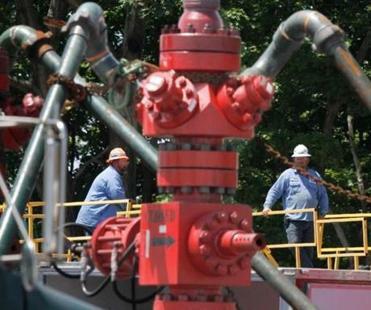 If built, these expansions would allow the region to benefit from a drilling boom that has opened vast reserves of natural gas in shale formations through the use of a controversial technology known as hydraulic fracturing, or fracking. Ultimately, it could mean lower energy bills for New England households and businesses, which increasingly rely on natural gas for both heating and electricity. Workers monitored a pump used in a natural gas hydraulic fracturing operation in Claysville, Pa.
“It’s an attractive opportunity for us to add capacity to the systems [and] allow customers to have more access to cheaper shale gas,” said James Daly, Northeast Utilities’ vice president of energy supply. Spectra Energy’s expansion, expected to cost roughly $850 million, would add 340 million cubic feet per day to the region’s gas capacity, a 14 percent increase, on the Algonquin pipeline. It would replace or add approximately 40 miles of pipe along existing rights of way. The additional gas would be nearly enough to supply all of the 300,000 Massachusetts customers of NStar Gas, a subsidiary of Northeast Utilities — though the supplies will ultimately be divided among several utilities. Northeast Utilities’ and National Grid’s preliminary agreements with Spectra to move a total of 225 million cubic feet a day of gas have been submitted to the state Department of Public Utilities for approval. Spectra, meanwhile, has made a preliminary filing to the Federal Energy Regulatory Commission and expects to submit a formal application in the first quarter of 2014. If approved by FERC, the expansion could be completed by 2016, said Richard Kruse, vice president of regulatory affairs at Spectra. National Grid and Northeast Utilities say they are interested in buying even more extra capacity. That could come from Kinder Morgan’s proposed “Northeast Expansion Project” that would add a new line to the Tennessee Gas Pipeline system, which also serves the Northeast and New England. The plan is still in the early stages and has not been submitted to the Federal Energy Regulatory Committee. The expansion would increase the system’s capacity by as much as 15 percent, or up to 1.2 billion cubic feet per day, according to a Kinder Morgan document. The projects come as New England struggles to address growing demand for natural gas and supply constraints created by tight pipeline capacity. Those constraints have led to shortages and price spikes during the peak demand periods, such as extended winter cold snaps, helping to drive the region’s already high energy costs even higher. Over the last decade, the amount of electricity in the region produced by natural gas has risen from about 15 percent to more than 50 percent, said Gordon van Welie, head of ISO New England, the region’s grid operator. In Massachusetts, natural gas accounts for 67 percent of the state’s electricity generation, and is also used to heat half the state’s homes. “Some days there just isn’t spare gas to be sold,” van Welie said. Additional pipeline capacity, van Welie added, would help alleviate the issue and could also lead to lower energy costs in New England, though just how much is anyone’s guess. Other pipeline expansion projects, however, may hold clues. Collectively those projects would increase capacity by roughly 25 percent, or bring 3.5 billion cubic feet per day to New York, New Jersey, and other Middle Atlantic states by 2015. The largest of those is Spectra’s New York-New Jersey expansion on the company’s Texas Eastern Transmission and Algonquin pipelines, which went into service Friday. Spectra forecasts show its project is expected to bring the price of natural gas in New York and New Jersey several cents below the national average. As in New England, energy costs in New York and New Jersey have historically ranked among the highest in the nation. “Having this new infrastructure online likely has the potential to decrease the severity of price spikes during times of high demand for New York and New Jersey,” said Michael Ford, an industrial economist for the US Energy Information Administration. Additional capacity in New England could have a similar impact, Ford added, but it is too early to tell. Environmentalists, however, question whether additional pipeline capacity is necessary or prudent, given aggressive renewable-energy mandates that require several New England states to reduce greenhouse gas emissions and use alternative-energy resources.